A flowerless room is a soulless room, to my way of thinking; but even one solitary little vase of a living flower may redeem it. you have no idea how those flowers are lighting up my room right now. Vita Sackville-West sure had that right. As for Joni... sans commentaire, a great song. Those flowers are beautiful and I couldn't agree with that quote more. I got a hanging plant for my room about a month ago and since then it's just altered the room somehow. Before it seemed lifeless now it seems alive. Gotta love living plants. Sackville-West wrote some interesting material about gardens & gardening. Love the pic & the video link. Ahhhhhh! It's always nice to look at flowers and listen to vintage Joni. And yeah, I learned about today being Barbie's birthday on the news this morning. Didn't you post the video of the Barbie Song for the "Toy" TT? I almost wished you a "Happy Birthday" and, just before tapping the publish button, I thought to check who "this gal" is. Beautiful arrangement. I have never heard of Sackvill-West until now. Love gardening and flowers so will check it out. If I was rich, a giant bouquet would be delivered every morning. I love the flowers. What an amazing flower arrangement! a word about the flower arrangement: this was an arrangement made with gathered flowers from the garden and woodlands near a friend's home in vermont in early september....this was one of many 'arrangements' created one morning in anticipation of her daughter's wedding that was taking place later that day. rlb -worok, sounds very space-age! efs - lots of plants in one's health is not only beautiful but healthy! 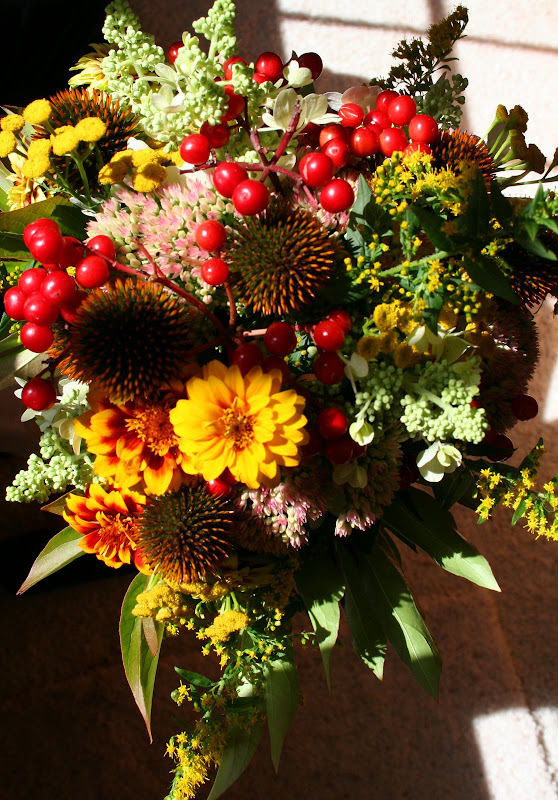 flawsnall - flowers gathered in the autumn have that ability of being celebrants of many seasons! calif - i too love getting flowers, picking flowers, looking at flowers, buying myself flowers....well i (heart)flowers!!! merle - me too! but there is little chance that will ever happen! dc - fleurs to you!! Loved her in concert a few years back--doing her "hits" and also some duets and newer Jazzy stuff that was great! She keeps growing and it's nice. The BBC is reporting that Barbie is in a "mid-life crisis" over a slump in sales. (!) slow news day. Thanks for sharing the lovely flowers and your time at the concert! Both are beautiful. I am cursed to be of a generation in which Barbie is an icon. I prefer both Joni and Joan. oh, i forgot to ask about your flower -arrangement, kimy...are the berries real? i'm still struck by the colors...the variety--and i like Calfornia Girl's comment...i want to tell you happy birthday, too...who said it really has to be the day? avid - I'm crossing my fingers that joni goes on tour again. I'm with you she gets better and I love that she never is shy of experimenting and trying out any style! "1976.05.16 Tarrant County Convention Center Fort Worth TX Joni's guest appearance with The Rolling Thunder Revue." joni - bob and baez (among others)-- does it get any better. e - to paraphrase a taunt: "joan and joni rule .... barbie drools"
flawsnall - the berries a real. thanks for the birthday wishes....I am very happy to have been born on whatever day that was! happy birthday to you too!